Ike - the first girl EVER to surf from Katiet. Woot Woot! 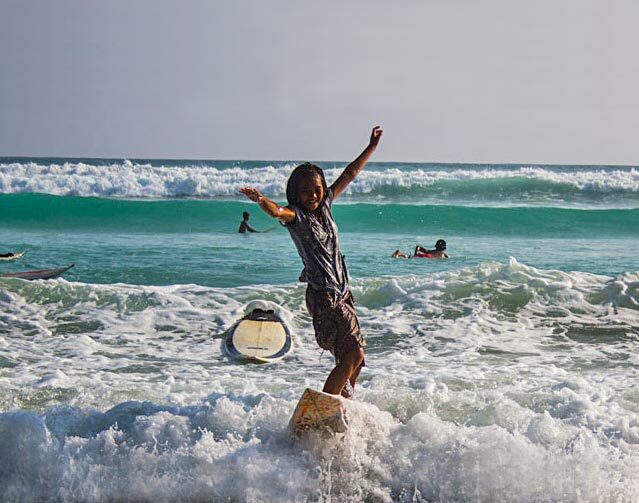 Meet Ike, 11 years old from Katiet village and the first girl EVER to surf from this area. And she’s hooked! After several trips to the beach break on the other side of the island Ike is now standing up and surfing. What an achievement for anyone, let alone for a girl from a village where no female has ever surfed before and no local women enter the ocean. She’s truly breaking boundaries and cultural norms, and blazing the way for all the girls in this area. Her parents are delighted with her accomplishments and fully support her in her new found passion. Ike’s older brother Ignasius is a great surfer and he’s been giving her some tips too. I asked Ike why she had never tried before when some of the boys her age surf. She replied that she didn’t know how to do it before and didn’t know how to go about trying, but now she knows how to do it and she loves it! I have leant her a board to use and the other week she paddled out at the beginner break near to Ht’s with all the boys who surf there. A bit surprised at first, the boys smiled when they saw her stand up and fully accepted and supported her. Wonderful to see. Although the children here have a wonderful adventure playground in the beach they have no one and no equipment (apart from old surfboards donated by visiting surfers) with which to learn new skills and be stimulated. Swimming and surfing, especially for the girls who otherwise do not practice any sports, are great for improving overall health as well as confidence. Many more women and children have died in recent tsunamis because they are physically weaker than men, rarely enter the water, and are often the ones at home. Interacting with the ocean in as many ways as possible (swimming, surfing, snorkelling) can give them so much- fitness, health, strength, confidence, understanding of the environment and the need to protect it and something to be passionate about. It is a future well worth investing in. Ike’s overall confidence in English, swimming, interacting with visiting surfers and her understanding, respect and love for the ocean and her environment are all increasing. Fantastic for her and the community as a whole as Ike will share her knowledge and skills with those around her. Girls are great conduits for communities in developing countries. Practices that they adopt will be passed on to their children. Girls are great investors in their families and that bodes well for the girls of Katiet. If you visit Ht’s in the coming years just don’t be surprised if you see some local girls getting barrelled at Ht’s. Look out boys!